OhGizmo! 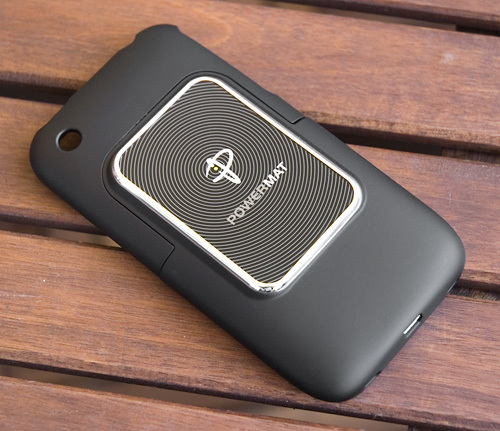 Review – Powermat Wireless Charging Solutions | OhGizmo! As we inch closer to the promise of a wireless world, the holy grail of cutting the cords, wireless power, still eludes us. WiFi, Bluetooth and cellular technologies have replaced network and other cables, and while they’re not perfect, they continue to improve every year. But truly wireless power, like being able to walk into a room and have your devices start charging automatically, is still something you only hear about in laboratories and R&D facilities. 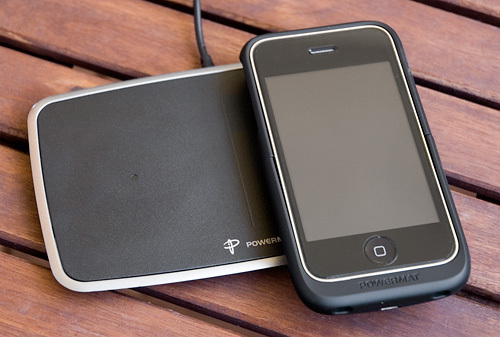 So for the time being inductive charging systems, like those offered by Powermat, are the best ‘wireless’ power solutions that consumers can actually get their hands on. The idea is pretty simple. An induction coil on a ‘base station’ plugged into the wall uses electricity to create an alternating electromagnetic field, while another induction coil on a device converts that same electromagnetic field back into electrical current which charges the battery. The technology only works across a very short distance, but it does away with the need for a direct electrical contact, meaning you don’t have to physically plug anything in, just place the devices near each other. While it’s not exactly the wireless power solution everyone dreams about, it’s still a far more convenient alternative to charging cables. The technology is still in its infancy though, at least in consumer-ready products like those from Powermat, and there’s still a few speed bumps that will have to be overcome before they become a must-have accessory in my opinion. 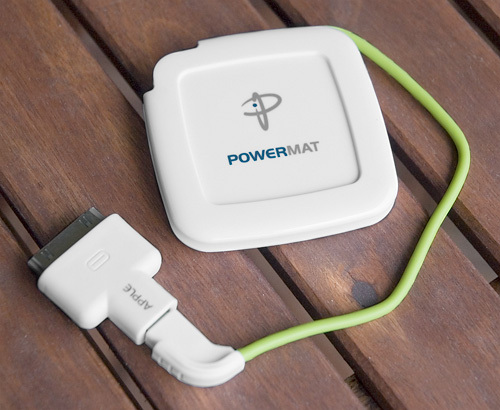 Powermat sells a wide variety of accessories but it’s their charging base stations or ‘mats’ that give the company their namesake. 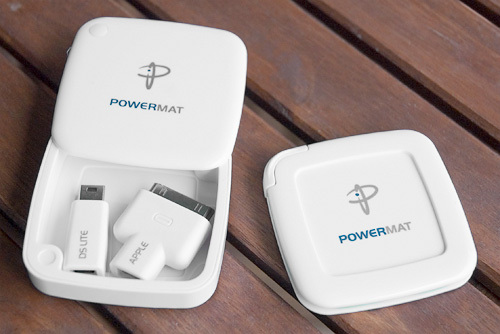 The version I tested is called the Powermat 2X since it’s capable of charging two devices at the same time, but larger versions, and even smaller single and travel-friendly mats are also available. As far as devices go it’s pretty clean and simple, but it has a few clever features that aren’t immediately obvious that I’ll talk about later. Of course the Powermat products still need to draw power from somewhere, so the Powermat 2X comes with a requisite power adapter that’s actually pleasantly designed. It’s fairly compact, and the folding prongs coupled with the cable spool design makes it easy to travel with, though to be honest, I think the inconvenience of bringing the Powermat base station on a trip cancels out the convenience of inductive charging. The technology is definitely best suited for the home or office. Now unfortunately this review has just barely gotten under way and I’m already at the point where I have to point out the one big ‘rub’ when it comes to inductive power and charging solutions. At the moment there are very few devices that have an induction charging coil built-in, and those that do, like the Palm Pre, only work with their own charging stations. 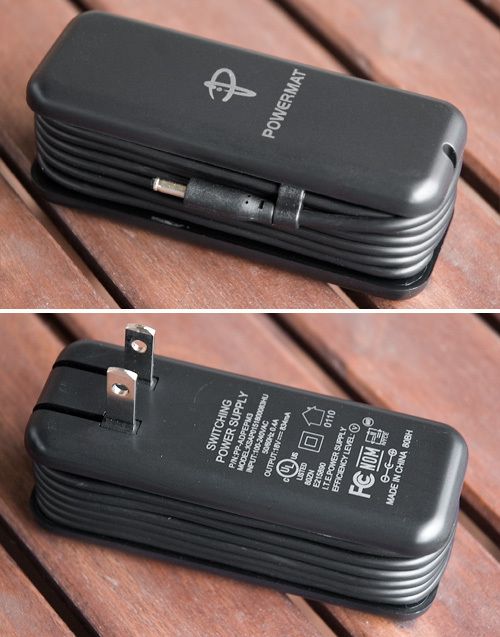 So companies like Powermat who want a wide range of devices to work with their charging systems have to create accessories like this that basically tack-on an induction coil to a device. 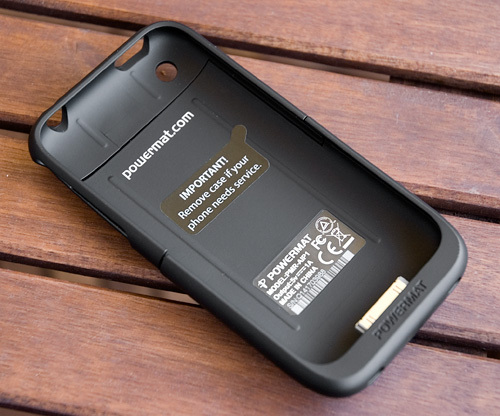 Now with something like a Blackberry that has a removable battery, Powermat sells a replacement battery that has an induction coil built-in. It does add a little bit of bulk to the back of the phone where the actual coil is, but I think it’s an ideal and easy-to-install solution for a device that doesn’t already have one built-in. But for other devices that don’t have a replaceable battery, like say the iPhone, you’re going to have to settle for an all encompassing case that adds a bit more bulk in exchange for the convenience of inductive charging. 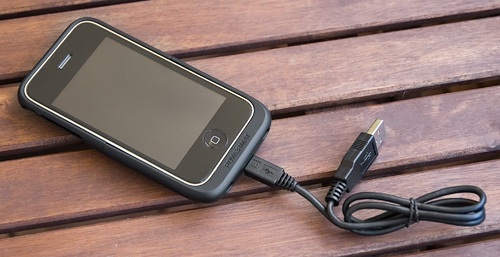 Like the Powermat Receiver Hard Case for the iPhone 3G and 3GS pictured here, that lets it work with the charging mat. Overall it’s actually a pretty svelte case with a nice rubber finish that provides access to all of the important ports and buttons, while also adding a bit of protection. 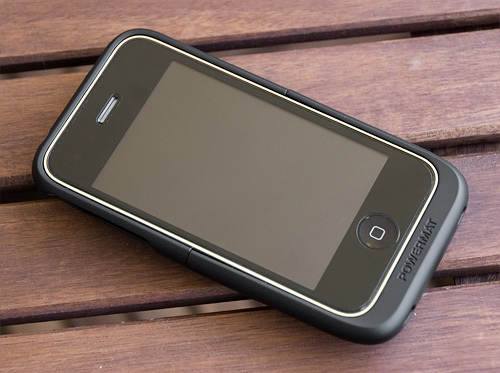 In fact if you already keep your iPhone in a hard shell case the Receiver Hard Case is probably not that much different to the one you already use, except that on the back of this case you’ll find the induction coil which does add bit of thickness to the overall package. …since that’s where the connection from the induction coil to the iPhone’s dock connector is made. And I imagine there’s a few electronic-y bits hidden in there as well. But here’s where inductive charging really shines. Once your iPhone is dressed and ready to go, all you have to do is set it down on the mat and it will automatically start charging. No cables to untangle, nothing to plug in and no buttons to push. You just set it down and the juice starts flowing. Now it’s important to ensure the induction coils are both lined up properly, but thankfully the mat features a strong magnet that basically pulls your device into the right position so it can start charging. In fact it doesn’t even matter if it’s been plopped down crooked or not. As long as the centers of the coils are lined up, which is facilitated by the magnets, your device will start to charge. And just so you know it is in fact charging, the mat makes a powering-up sound effect once the device has been detected, and a small light appears along the edge of the side you’re currently using so you know it’s on. And when you remove the device, it makes a powerering-down sound effect instead, and the lights go off. Pretty dead simple, and like I already said, that’s where the inductive charging technology really shines. But there’s one other issue I have to point out when it comes to using the Powermat with the iPhone. As you can see here, the bottom of the Receiver Hard Case does include a couple of grills so as not to block the iPhone’s mic and speaker, but instead of the standard dock connector, there’s another smaller proprietary port. What could it be? Well it turns out, unfortunately, that if you want to sync your iPhone to your PC while it’s wearing the Powermat case, you have to use an included USB adapter cable since you don’t have access to the native dock connector on the bottom. So not only do you have to deal with another cable, which kind of goes against the whole ‘wireless’ thing, but in order to use it with dock connector accessories, like say your car’s stereo system or alarm clocks, you’ll have to remove it from the case. 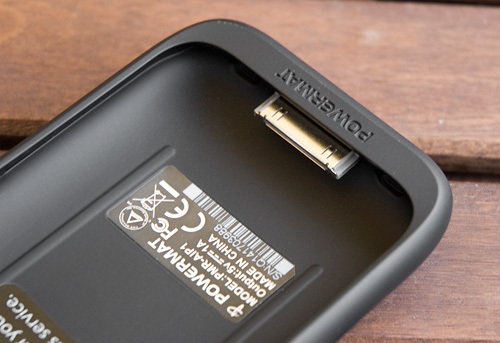 Now I’m not sure if creating a pass-through is even possible, so that you can still access the dock connector while your iPhone is in this case, but if it was I think it would be a must-have feature for future versions of this product. And what happens if you want to charge another piece of electronics that Powermat doesn’t produce a replacement battery or adapter case for? Like say a less popular cellphone or a handheld gaming device like the DS or PSP? Well there is still a solution thanks to Powermat’s Universal Powercube Receiver. It’s basically a small pad with an induction coil built-in (sitting on the right) that can be used with a collection of included charging ‘tips’ that are compatible with everything from LG and Samsung cellphones, to the DSi and DS Lite and even iPods featuring the dock connector. And it even comes with a matching carrying case for the tips you use most often. The charging cable unwraps from around the Powercube, and you simply attach whatever adapter you need to use, pretty simple. And like with the Receiver Case on the iPhone, all you have to do is set the Powercube on the mat to start a device charging. However, when you see it in use, it’s kind of hard to justify using the Powercube for anything other than a tech demo when you could just plug a given device directly into the wall. I mean the shot here doesn’t exactly look like a wireless charging solution to you does it? 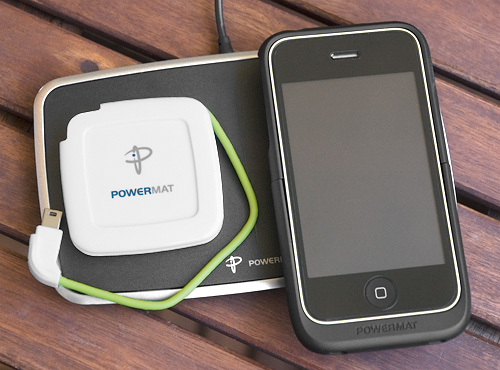 So while it’s nice that Powermat has created a way to charge almost any device with their inductive mat, I can’t really say that it makes things any more convenient. I love the idea of inductive power. Sure it’s not truly wireless power, but it has the potential to be just as useful. At CES every year there are always a handful of companies showing off clever inductive power solutions that let you do everything from just setting a blender down on your counter and having it come to life, to turning almost any surface into a safe place to cook with the right cookwear. However, the technology is completely dependent on the induction coils and before it has a chance of being as common as a wall outlet, manufacturers of everything from counters to desks to electronics are going to have to start integrating it into their products. 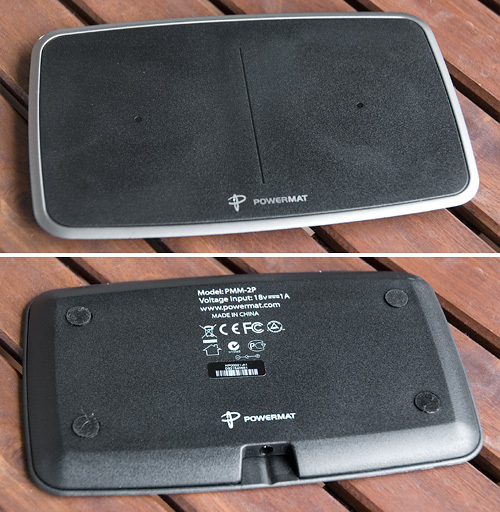 Powermat has definitely come up with some useful solutions for consumers who want to take advantage of inductive power and do away with their charging cables at this point and time, but it still comes across as being a workaround, and I’m not sure if everyone will agree that the advantages outweigh having to buy a charging mat and a replacement battery, or use an adapter case. 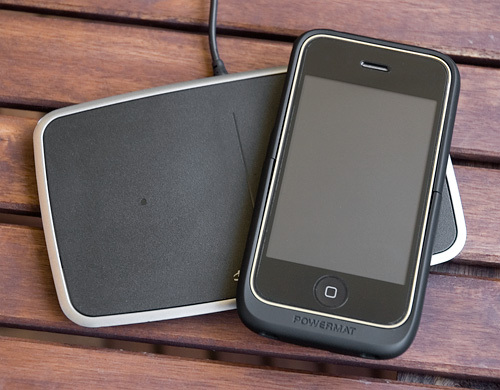 Hopefully companies like Powermat will eventually be able to sell their technology directly to manufacturers so that in the future you can buy a desk from IKEA that has an inductive charging base built-in, and know that you can set your next Blackberry or iPhone on it, right out of the box, and have it start charging. 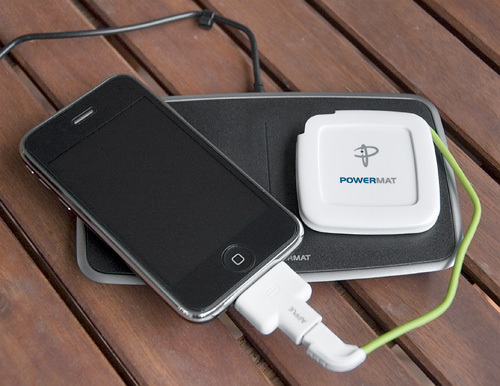 + With the right phone the Powermat base and accessories provide an extremely handy alternative to charging cables. + Dead easy to use, you simply set your device down and it starts charging. Nearly impossible to screw up. – Cables still come in to play with the Universal Powercube Receiver for devices that don’t have native Powermat accessories, and the charging mats still need an outlet. – Receiver Case for the iPhone 3G & 3GS does add some bulk and makes the dock connector inaccessible. – Can get a little pricey if you want multiple charging pads at home for convenience, or one at the office too. If you have any questions about the Powermat products you’d like answered, please feel free to leave them in the comments, and I’ll try to respond to them as best I can. How does it do in terms of vampire power? Does it keep using energy to pump waves into the air even when nothing's charging? I'm sure since it has a connected signal and disconnected signal. It only is drawling power when a device is connected. Although I'm sure its always drawling small amounts of power to power the connection signal. Its the same as most all inductive power. A full circuit most be made in order for power to be received. Great device, just wishing for a way to charge without putting on a stupid case. Well the case isn't really the problem its the mini USB they make you use when the case is on.. I have an iPhone because I have an ipod dock, an ipod stereo, an ipod car stereo. I'm not really willing to give up all those just to be able to set down my phone and have it start charging. Although I can see this changing in the future, which is exactly what I'm waiting for.